Samsung Galaxy S III 19300, the new smart phone from Samsung cleverly designed. Samsung always keep its spectacular creation for youth. Last few years they silently compete with Apple iPhone . It's a 100% sports man approach. They can acquire a safe zone in the field of smart phones. 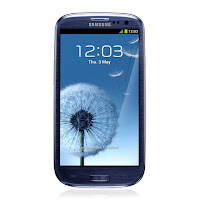 Samsung Galaxy S III provide us several new features. Main features divided into three parts. Intelligence, Sharing and Greatness. Intelligence S Voice (modified version- similar features of Apple iPhone’s Siri), Social tag for social media streaming and friends apprising, direct call, Smart stay ( bright display adjustment for continued viewing preference) etc. are the main features of Intelligence section. S beam for transfer documents, pictures, music and videos in a sharing environment. AllShare Play- the remote access to execute multimedia files through the technical support of Wi-Fi and DLNA, Buddy photo share, AllShare Cast etc. are the important features included the sharing Tab. Finally the Greatness Tab, Samsung tell us its design. The company says that The Samsung GALAXY S III shines its minimal and organic design pattern. The design is reflected in its smooth and non- linear lines.